“Moog Matriarch is a semi-modular, 4-note paraphonic synthesizer and the newest member of the Mother family of synths. 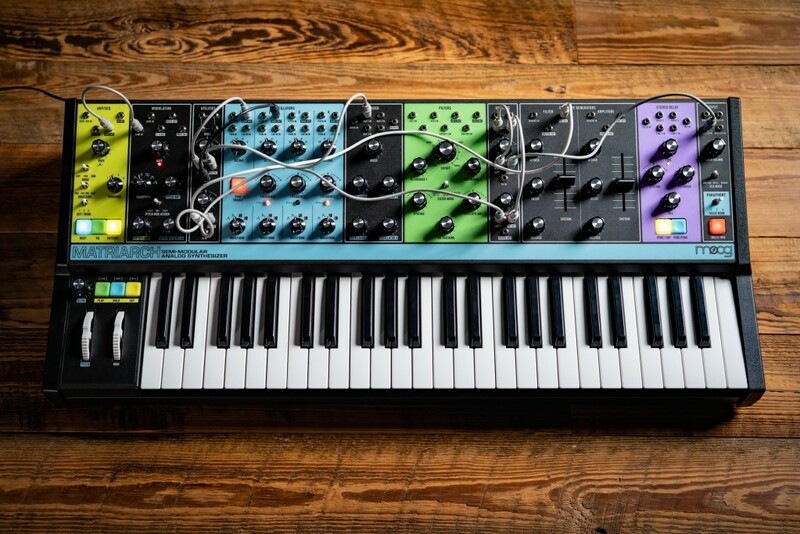 Moog has taken the elements of their semi-modular line and given it a flagship – a patchable, calico-colored keyboard with sequencer, 4-voice paraphonic synth, and effects in one keyboard. The pitch: even before you plug in cables to the copious patch points here, you can quickly get evolving strings of dreamy chords (or rich melodies), complete with delay and modulation. Those extra (analog, they want you to remember) specs aren’t just about more features. They’re about dialing in imaginative sounds. And so the Matriarch is an all-in-one keyboard that draws from Moog’s modular legacy, but in an integrated design you can use both with and without patching. We’re definitely living in a weird timestream. When I started writing about music tech and joined Keyboard in the early 2000s, “workstation” keyboards were digital affairs, with functionality hidden deep in menus and screens. The key was to put as many instruments as possible – analog synthesis being seen as something retro and niche. Moog for their part had the Voyager, which took the Minimooog line in the direction of new analog exploration. But even Moog’s offering was primarily connected with MIDI cables, and had a touch panel right on the front. And even if Moog are still (happily) outside the mainstream, there’s nothing saying their Matriarch has anything but broad appeal. So here’s a keyboard proudly with wires popping out the top. And while Moog prominently tout “all-analog signal path” and “retro” design, we’re really seeing ourselves back in the parallel universe where analog synthesis never went away. On one hand, we’ve come full circle to some of the features first introduced in analog synthesis, but now it’s clearer what they’re for and how to make them more accessible. 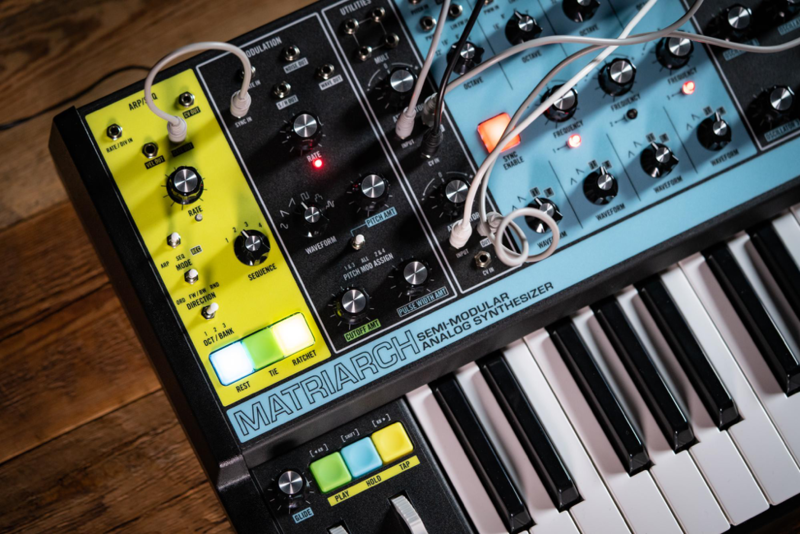 So for all its 1970s-derived features (Moog name included), the Matriarch is inventive in a way that makes sense in 2019. 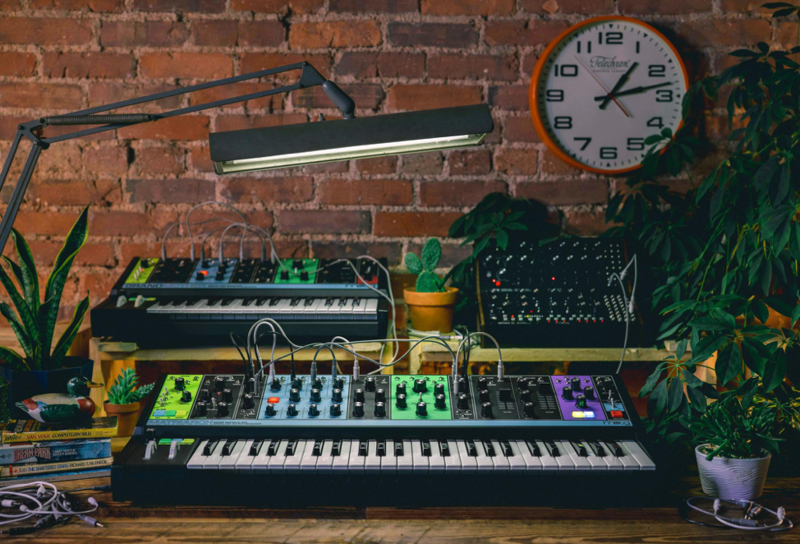 Moog are pulling from the modular world, too, more aggressively than ever. Not only is this patchable, but the design does imagine a series of modules. So you get Minimoog oscillators, a mixer, classic Moog filters, envelopes and sound shapers. They’ve also built in a sequencer/arpeggiator. The voice configuration allows mono, duo, and paraphonic playing modes, plus you have four notes per step in the sequencer. My sense is what will make this interesting is the multiple modes on the filters combined with a Moogerfooger-like analog delay and tons of modulation. So you have dual ADSR envelopes and dual analog amplifiers, and two filters you can use in parallel or stereo or series. The delay is stereo (and ping/pong if you want) up to 700 ms – still waiting on Moog to tell me how short that delay can go. Oh yeah, and ring mod possibilities also sound interesting. Plus they’ve got mults in there for making patching deeper onboard. I would personally be pretty tempted by Moog’s own Grandmother, the Matriarch’s baby sibling – with a street price around $800. It’s a monosynth, and the whole architecture is scaled accordingly. (It also has a spring reverb tank in place of the Matriarch’s delay). But you could use the saved money for a little Eurorack skiff. That said, the Matriarch is a thoughtful, colorful, appealing new top-of-the-line for this family of Moogs. And it gets a Moogfest limited edition at the festival happening now – plus a lot of artists gathered who I’m sure will really want one. 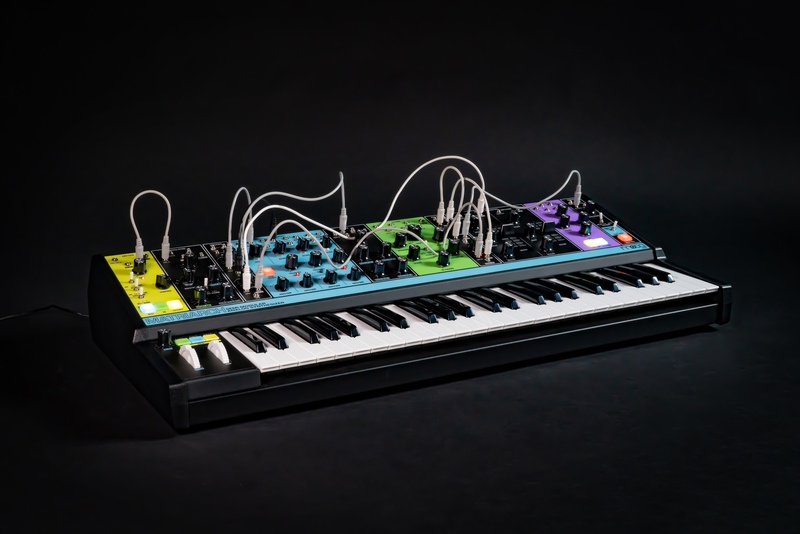 The post Moog Matriarch puts all your analog sound shaping in one keyboard appeared first on CDM Create Digital Music. I used NI RC24 Reverb and Replika Delay. This one goes out to Mike. “Here is a quick tip on how to make a plucky bass sound on a Moog synth.